"한국 최초 평일에 열리는 드랙쇼!" 매주 화요일 저녁 9시, 해방촌에 위치한 앨리벙커에서 토크와 게임이 곁들여진 공연이 열립니다. 한주의 시작과 함께 찾아오는 스트레스를 드랙쇼를 즐기며 날려버려요! 본 공연은 서울 드랙 퍼레이드 주관 행사입니다. 소셜미디어에서 서울 드랙 퍼레이드를 팔로우 하시면 본 공연 및 매년 열리는 퍼레이드 등 드랙 관련 행사들에 대한 정보를 업데이트 받으실 수 있습니다. 드랙 튜스데이에서는 매주 1-2명의 성소수자 아티스트에게 오픈 마이크를 통해 무대 공연 연습, 인지도 향상 및 네트워크 구축의 기회를 드리고 있습니다. 공연을 원하시는 분은 간단한 소개, 사진, 영상을 포함하여 seouldragparade@gmail.com 으로 신청 하세요. 대기 명단이 있거나 거절될 수도 있다는 점을 미리 말씀드립니다. 앨라이 분들 또한 신청이 가능하지만, 오픈 마이크 슬롯들은 성소수자 당사자 분들께 우선적으로 주어진다는 점 이해 바랍니다. 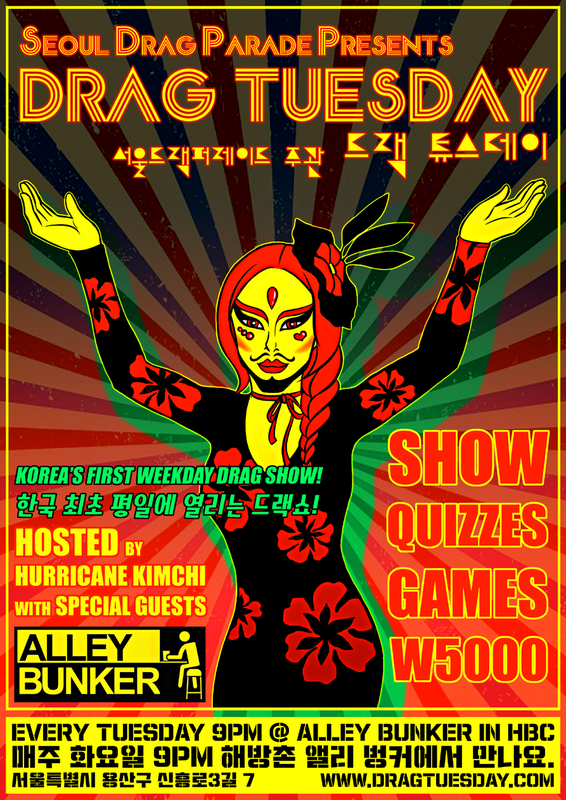 "Korea's First Weekday Drag Show!" Every Tuesday, at 9PM, at The Alley Bunker in Haebangchon. Come and enjoy a drag show with performances, games, and talks. It will give you the energy and laughs you need to get through the week! This show is organised and funded by Seoul Drag Parade. Follow SDP on social media to get updates on Seoul's drag events, including the annual parade. We have a slot or two for LGBTQIA+ performers who want an opportunity to practice performing, gain exposure, or try out new materials. If you wish to perform at Drag Tuesday as an open mic-er, apply now by sending an email to us at seouldragparade@gmail.com with a brief introduction of yourself, photos and videos. Note that there might be a waiting list and a chance you may be rejected. Allies can apply as well, but please understand that LGBTQIA+ people will be given priority in claiming the slots.